1. What is the story of the Fondue restaurant? 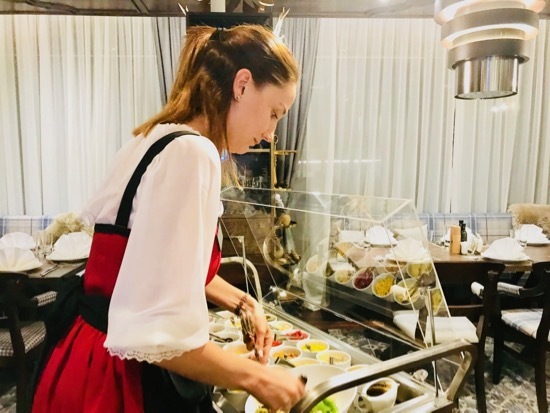 On 15.11.2017 in the Lucky Bansko aparthotel was opened a new thematic restaurant – Fondue, which offers its visitors specialties of the Swiss cuisine in a cozy and stylish atmosphere. 2. What do you offer to your customers? The menu of the restaurant is very rich and varied. The assortment of dishes includes salads of leafy and root vegetables, cold appetizers, fondue with French and Swiss cheeses, fondue with oil or vegetabe broth, various types of meat and fish products, Raclette, meat in alpine, prepared on a hot plate, garnished according to the taste of the client, and last but not least – unique desserts including fondue with four types of chocolate, alpine dessert and vegan sweets. 3. What is the favorite thing of the visitors? The guests of the alpine restaurant Fondue enjoy the wonderful atmosphere and professional attitude of the personnel, but most of all they are attracted by the high quality food and first-class drinks. 4. Which type of fondue is ordered most often? What are the taste preferences of the Bulgarian customer? What about the taste preferences of the foreign customers? One of the most wanted dishes are the classic fondue with Vacherin and Gruyere cheese, veal bon fillet Black Angus and venison bon fillet. The foreign visitors prefer fondue with cheese or with oil and the Bulgarian visitors like the meat in alpine, prepared on a hot plate, including salads and fondue with cheeses. The fondue with chocolate dessert is loved by all. 5. What is your formula for success? Our success formula is: Professionalism, desire for development, good attitude towards the guests and teamwork. 6. What makes you unique, what distinguishes you? As the only one of its kind in Bulgaria, the Fondue restaurant offers its guests a unique experience and an authentic taste of the Alps. We are proud of the achieved results and the satisfied guests. 7. What would you like to say to your clients – present and future? Welcome to the Fodue restaurant, come and feel the atmosphere of the magical “Bulgarian Alps”. You will get more than you expect!! !